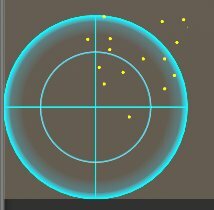 i try creating radar gui. but, no visible for use OpacityMask and RadialGradientBrush. Any idea? for mask ring out yellow maker. Anyway, if you found a situation where OpacityMask is not working fine, could you please create a ticket in our bugtracker attaching a minimal xaml that reproduces it? After reading again your message I think I misunderstood what was happening to you. I guess you want to apply an OpacityMask to mask out the yellow marks, not to create the blue radar shape using an OpactiyMask, sorry. I was able to reproduce the problem with OpacityMasks in Unity, they are vertically inverted, so when you place the radar at the bottom nothing gets rendered (it shows fine when centered in screen). Please report this at our bugtracker and we will try to fix it as soon as possible. RadialGradientBrush is need Center,Radius setting. But I have not obtained the results I expected. I will post video and code comparing OpacityMask animation and Fill animation. but, vertically (and rotate) inverted. Thanks for the reports, we will fix them as soon as we can.